I like that it will compliment the copper sink that I bought. 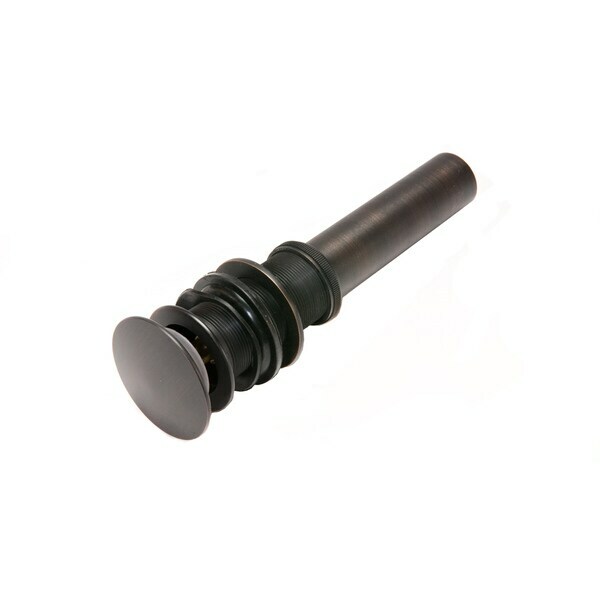 Maximize elegance and functionality in your bathroom with this oil-rubbed bronze sink drain. Made of brass for durability and strength, this sink drain is made to last and includes a limited lifetime warranty. I purchased this drain along with the hammered copper Fleur de Lis oval sink. The only problem is the drain can't be tightened enough in the sink to prevent all leaks and if you try to tighten it then you can't release the drain valve once it is depressed. I sent a message to Premier Copper Products and within 1 hour had a response and notification that they were sending me an extra rubber washer that I can install. Great customer service from the manufacturer! Nice looking drain and extremely easy to install. It is actually very large though and protrudes upward into the sink alot which kind of surprised me. Love the look and the feel. Very high quality. It is the perfect item for my bathroom. I love everything I have purchased for my bathroom. Makes it look very nice. Another great buy from Overstock.com. My first place to shop! Always! I appreciate Overstock.com. They have never disappointed me in anything I order. All products have been top quality items. These drains worked perfectly in our copper sinks in our bathroom. Very nice. My only problem was this pop up drain was shown with the faucet I bought so I purchased both to go together only to realize when it arrived I have an overflow sink and this would not work. So I ended up having to purchase another pop up over flow drain. This drain is well-made and heavy duty...you will not regret this purchase. If buying a copper sink this is a must have. I purchased this on recommendation from another customer when we purchased our copper sink and I am glad we did. When installing the sink we realized that we would have to use it. The one that came with our fixtures would not work. Works perfect in our Coffee Bar sink in kitchen! Love how easy it was to install and color is amazing! It's a very pretty item, but unfortunately it didn't work when installed with our copper sink. The pop-up mechanism didn't work. It may be a function of the particular sink that we have. This product was high quality and we received it in days. I just received this yesterday. It is beautiful. It will be going into my house I am renovating but can't give a complete review till then. I did make sure it worked and it does. And it is as the picture showed. This product came in earlier than expected. Even though the s8nk came with, we decided to keep it. Very satisfied!! Very good piece, used for my vanity sink and worked out great! "Can a wide spread faucet be used on a pedestal sink?" "Hello, how deep (inches) is the thread from the top of the top of the pop-up? The distance from my vessel sink to the bottom of my cabinet is over 3" so I need to know if the thread is long enough. Please advise. Thank you!" Hello dabenzo, the measurement from the pop-up to the end of the thread is approximately 3 1/16 inches. Thank you for shopping with us! It was what I was looking for at a good price. "There were no instructions how to install. Can you provide a link?" Hello Peggy6033! We will love to assist you! Please scroll to the bottom of the page and click the link for the Customer Care, so we may better assist you. Thanks for shopping with us! "The description of this item says "Non-overflow 1.5 inch ...." yet the product description says it is 2.5 inches. I need a drain for a non-over flow copper vessel sink that has a 1.5 inch opening and do not know if this one will work. Please advise. Thank you." "Does this fit a 1.5 drain opening?"